As law firms expand across the globe and lawyers travel from their home countries to work and be educated in other parts of the world, it has become increasingly important for lawyers, law schools, hiring and training professionals and placement agencies to understand different legal and education systems and rules for qualification and admission. 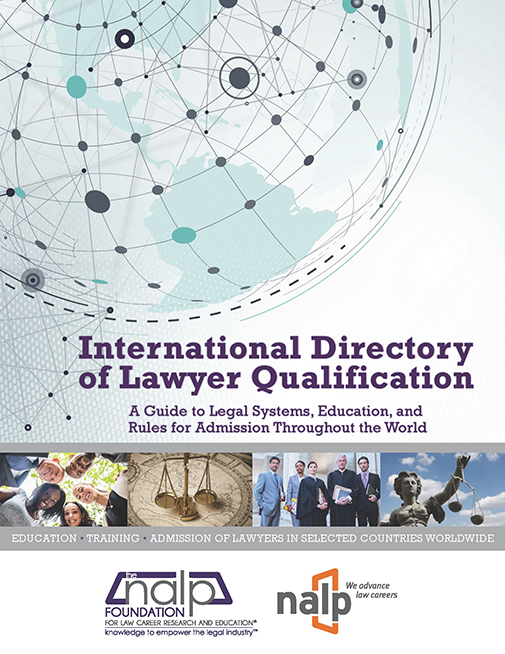 NALP and the NALP Foundation are pleased to offer the updated and expanded edition of the International Directory of Lawyer Qualification: A Guide to Legal Systems, Education, and Rules for Admission Throughout the World. This resource provides background information on all of these matters for 58 countries and allows the users to gain a deeper understanding of a particular individual’s credentials or a country’s system as a whole. Also included in this new edition are sample resumes, grading systems and comparisons, and an explanation of awards and honors offered in law schools. AVAILABLE ONLY IN SECURED ELECTRONIC FORMAT. For pricing information and to order, visit the NALP Foundation Bookstore. Discounts available to NALP members.